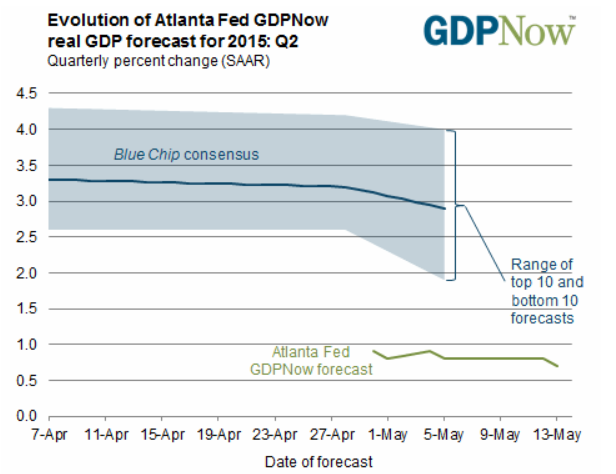 Mish's Global Economic Trend Analysis: Second Quarter GDP Forecast: Blue Chip vs. GDPNow; Where Might the Fed be Wrong? Second Quarter GDP Forecast: Blue Chip vs. GDPNow; Where Might the Fed be Wrong? Following yesterday's dismal retail sales report, inquiring minds may be interested in the Atlanta Fed GDPNow Forecast. The GDPNow model forecast for real GDP growth (seasonally adjusted annual rate) in the second quarter of 2015 was 0.7 percent on May 13, down slightly from 0.8 percent on May 5. The nowcast for second-quarter real consumer spending growth ticked down 0.1 percentage point to 2.6 percent following this morning's retail sales report from the U.S. Census Bureau. Where Might the Fed be Wrong? The Blue Chip estimators appear to be in some other alternate universe, especially that 4% forecast. Instead, let's focus on the Atlanta Fed model. In light of retail sales, I suspect PCE of +1.76 is on the high side. If so, and if inventories and exports are worse than shown (which I also expect), we are in or close to negative territory, and in recession. Note that the NBER does not require two consecutive quarters of negative GDP to call a recession. Rather, two consecutive quarters of declining GDP is a sufficient but not necessary condition.